A new benefit is now available to NC Soy Alliance members! When you purchase or renew a membership in the Alliance, you will receive a Seed Rebate Coupon worth $100, an instant break even on your membership purchase! All the brands here are participating in the Seed Campaign and we are excited to be partnering together to bring you this benefit! AN INSTANT BREAK EVEN ON YOUR MEMBERSHIP! Many decisions affecting your profitability and your freedom to operate are made by people who have never stepped foot on a farm. When policy and regulations that affect soybean farmers are being debated on Capitol Hill, the NC Soy Alliance will be there to protect your interests with the American Soybean Association. The NC Soy Alliance is a voluntary membership program focused on policy and advocacy for the interest of the soybean farmer. Membership in NC Soy Alliance is above and beyond the basic, no-cost membership offered by N.C. Soybean Producers Association to all N.C. soy growers. A newly added benefit available to all of our members is our Seed Rebate Campaign. Those who purchase or renew a membership in the Alliance will receive a seed rebate coupon worth $100, an instant break even on membership! Expand the drop down box below to see more information and the partnering companies. 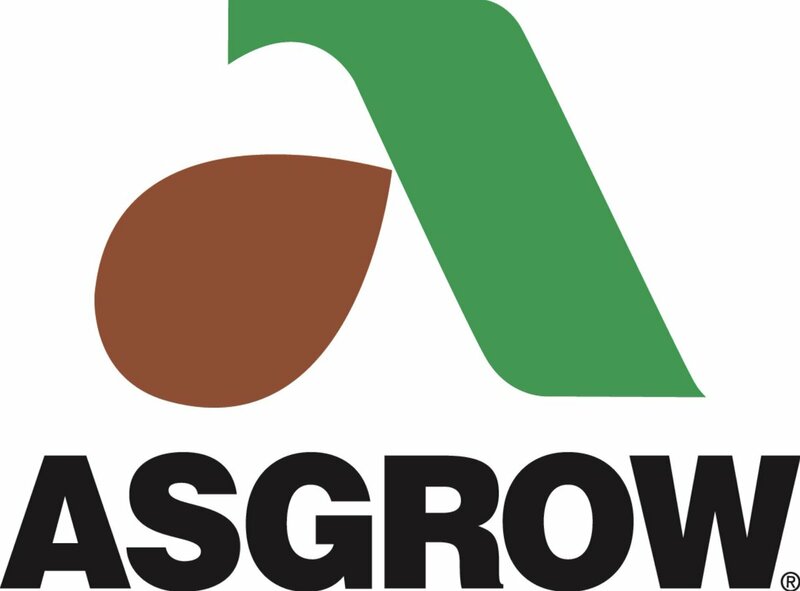 Your membership in the NC Soy Alliance automatically includes your complimentary annual membership in the American Soybean Association (ASA) and all ASA member benefits. With this program, you will now be receiving 2 memberships for the price of 1! Beginning in October 2016, ASA memberships are available only through state affiliates like the NC Soy Alliance. 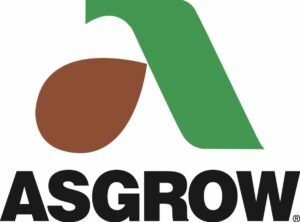 North Carolina growers who have unexpired and lifetime ASA memberships will receive equivalent credit towards NC Soy Alliance membership. We are now offering a Family Farm Discount. If you have multiple individuals from your company who want to join the NC Soy Alliance, you now have an opportunity to save. The more people who sign up, the more you can save per person! **Those interested in the Farm Membership Discount, please contact NCSPA office at 1-800-839-5775 for forms or download the form in How To Sign Up. A new benefit is now available to NC Soy Alliance members! When you purchase or renew a membership in the Alliance, you will receive a Seed Rebate Coupon worth $100, and instant break even on your membership purchase! All the brands listed below are participating in the Seed Campaign and we are excited to be partnering together to bring you this benefit! We will include information on how to get your rebate when we send you your new membership packet! *Please note that rebate partners may require a minimum purchase. 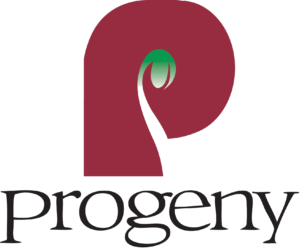 Rebate agreements are solely between the seed partners and seed purchasers. 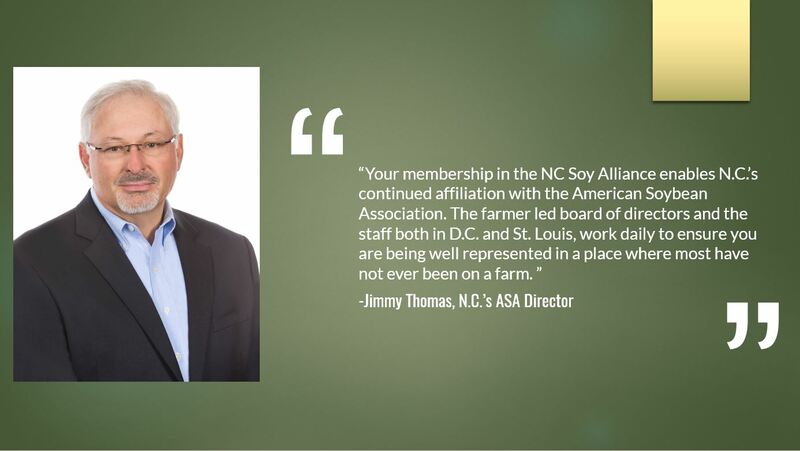 Besides belonging to two organizations – NCSA and ASA – that work for your interests in Washington, D.C., there are many other benefits to becoming a member of the NC Soy Alliance. Policy representation in Raleigh and in Washington, D.C.
Find a full list of ASA’s member benefits HERE. 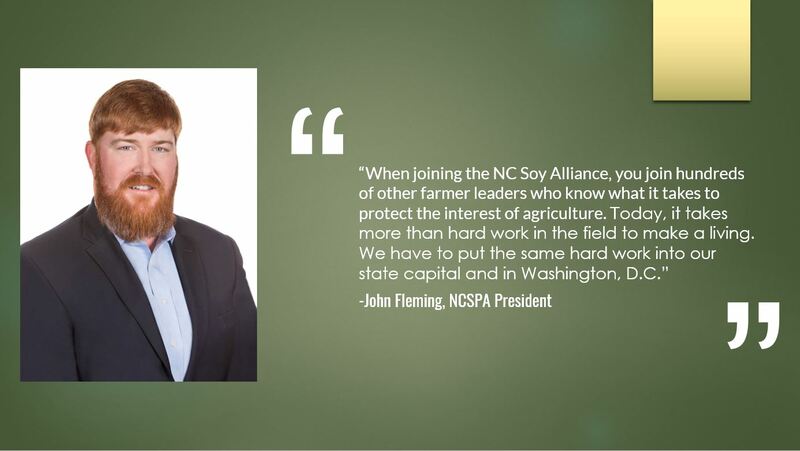 The NC Soy Alliance is the membership-based policy and advocacy arm of the North Carolina Soybean Producers Association, and the North Carolina affiliate of the American Soybean Association. NCSA and ASA work together on farm legislative and regulatory issues. Along with our support for ASA, here are additional topics that we see as priorities. There are a couple of ways to become a member of the NC Soy Alliance. One way is to sign up online HERE, and at the top of the page, through ASA’s website and choose NC as the affiliated state. The EASIEST way to signup is to download the membership form below clicking HERE and mail it back to the address provided. This is the quickest way to receive you Seed Rebate! Interested in being an Alliance Recruiter? Find out all the details and rewards HERE.